For use with the Skinpack installer - see the README to understand how to install these. 4FS, 13FS, 14FS, 22FS, 23FS, 34FS, 35FS, 36FS, 55FS, 77FS, 79FS, 80FS, 125FS, 138FS, 163FS, 174FS, 184FS, 389FS, 457FS, 466FS, 510FS, 523FS, 555FS. 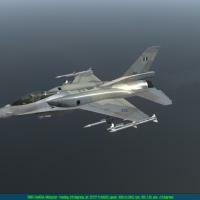 As you will see in the README the only skin altered for the F-16D is the 138FS. Extract the .skn files to suitable folder - then install using the skinpack installer. A free Windows program with source code available for modification. Allows easy configuration of Cockpit settings. Use at your own risk - The author does not take any responsibility if this causes problems with your operating system. Skin Pack Installer by the Gamers Tools. This free Software is for Falcon 4: Allied Force on Windows only. Documentation is included - Use at your own risk - The author does not take any responsibility if this causes problems with your operating system. Mod Pack Installer by the Gamers Tools. When you download this file - extract the .mdk file and put it into the folder you are using to store .mdk files. Falcon 4 Allied Force has planes that are unskinned - and until you play the campaigns you don’t realise what a killer this is seeing a bright white jet! Anyway it’s annoyed me enough to do these skins. The SU-32 model in this sim is hopeless and I can’t find where some of the texture mapping comes from – so its limited effort at best on this one! Will see about doing one for the skin pack installer if there is any need. This is a slight rework of my E/A-18G skin - Falcon 4: Allied Force has various planes that are unskinned - and until you play the campaigns you dont realise what a killer this is seeing a bright white jet while browsing through the freindlies! Anyway its annoyed me enough to do these skins. The included instructions are for installing the skins using LOD Editor - though trust me it ain't rocket science - just time consuming. Once I have time I may get it to work with the skinpack installer from gamers tools if any demand. There are many unskinned jets in Allied Force - and I haven’t got enough years left to make skins for all of them - so if you are that bothered about unskinned jets this is a brief how to on how to convert files for use with Falcon 4:Allied Force. I could just post the skins Ive converted over but they are not my skins – so you will need to do a bit of DIY. Guide is in Word 2002 and html formats. NOTE: The same model and skin is used for the F/A-18F and E/A-18G so we are only installing this once. This skin can only be installed fully using LODEditor I’m afraid due to a fault with the 3D model. Any version that uses the skin pack installer will not have skinned wheels, engine nozzles, pilots and the campaign will still use the unskinned Set 2. The "radar image" on the left shows the current weather. Black is the background, white are cumulus clouds (the new puffy clouds in F4AF), from grey to purple are increasingly thick stratus clouds (the ugly old F4 weather), precipitation starts with blue and increases; thickest clouds bring thunder and flash. The right image contains some information about the cloud base altitude. Unfortunately, this isn't too useful right now. To get snow, reduce the temperature to below ~5° C.
Some antivirus software may identify this installer as malware, this is a false-positive and please disregard it. This package is provided "As-is" and therefore i cannot be held responsible for any damage it may cause. Use it at your own risk. The content of this installer is copyrighted. You may not redistribute the content of this installer, edited or not. This applied to models and textures. You may distribute an unmodified installer. Some credit goes to JanHas as in the original pack, for some parts of his texture. This package includes AGM-65E and AGM-65F models, unfortunately in f4 object database the models are shared by AGM-65G parent record, therfore they look the same. To enable them, you will need to change a few numbers in lod editor. Step 1. Open lod editor and find AGM-65E (ct number 243), then change the "normal" parent number to 3855. Click update. Step 2. Find AGM-65F (ct number 3733), then change the "normal" parent number to 3856. Click update. Also i do not recommend using this package on a slow machine. The models are detailed and on slow machine you may get low fps. Just run the installer, if you have all models installed, and it will ask you whether you want to uninstall. Another way is to run the "Restore_objects_backup.exe" in the falcon root directory. Or you can go to Add/Remove programs in windows control panel, and uninstall from there. To update to future versions, simply run the new installer, already installed models will be grayed out. Tweaked some lod distance numbers. This is an assortment of Training exercises submitted by Axe.